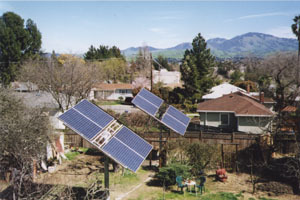 Solar energy is the most powerful resource that can be used to generate power. So far the efficiency of generating power of solar energy is relatively low. Thus, how to increase the efficiency of generating power of solar energy is very important. According to Wiki A solar tracker is a generic term used to describe devices that orient various payloads toward the sun. Payloads can be photovoltaic panels, reflectors, lenses or other optical devices.It is used to minimize the angle of incidence between the incoming light and a photo voltaic panel. This increases the amount of energy produced from a fixed amount of installed power generating capacity. This project idea is for students of Mechanical and Electronics engineering. Moreover , students of MIT have won prize for the same.Cleveland State University students has done project on sun tracker in 2008.